John Thomson writes "Here is FOLLY (the best boat name I've ever come up with if I do say so myself, ABSURDITY and IDIOCY were contenders). She is 16' LOA with a 4' beam, stitch-and-glue construction. 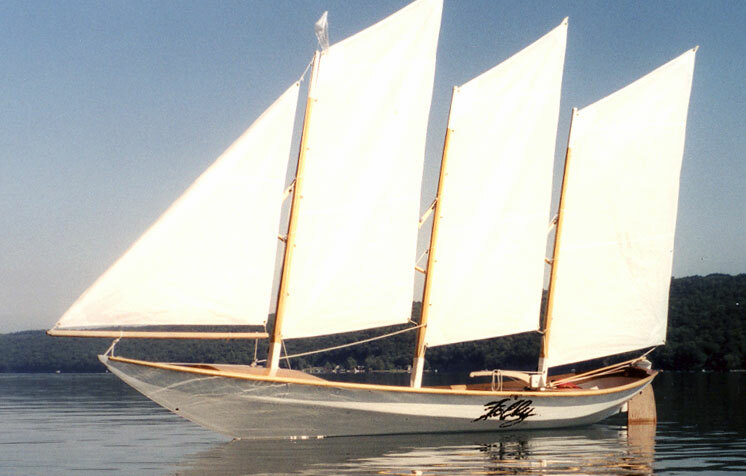 She is emphatically not meant to be cute, no phony, salty details, but designed to get 90 square feet of sail down as low as possible for stability in the sort of high winds we sometimes get here on Skaneateles Lake, NY." He launched her in September 2001, and adds that she sails fine.